Instant Pot Stuffed Peppers are delicious and extremely easy to make! 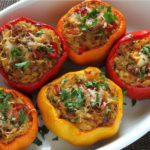 I have always made stuffed peppers using the traditional oven baked method. I would have to wait until Autumn or Winter to make my recipe because I didn’t want to heat up my kitchen in the middle of summer. Instant Pot Stuffed Peppers are perfectly cooked with just 8 minutes of cooking time! Using the baked method, my oven would be on for at least one full hour. In the middle of a hot summer day, it just wasn’t worth it! 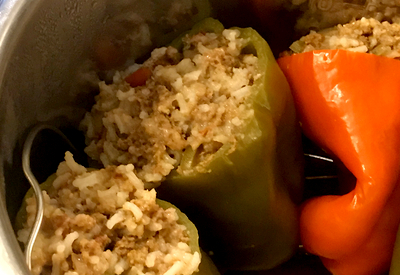 But when I purchased and began using my Instant Pot 6 quart Duo – I knew that I could convert my recipe to make Instant Pot Stuffed Peppers. The Instant Pot 6 quart Duo has truly changed my cooking habits. I would avoid recipes that took too long to make. Or I would skip over recipes that required me to heat up my oven in the middle of summer. Now I get to throw those family favorite recipes back into the monthly routine. Instant Pot Ribs, Pulled Pork, and Whole Chicken are just some of our favorite recipes that are made in the Instant Pot. Because they cook in a fraction of the time as compared to traditional methods and taste great! See all of our favorite Instant Pot Recipes here: Instant Pot Recipe Pages. Instant Pot Stuffed Peppers – to pre-cook the meat or not? 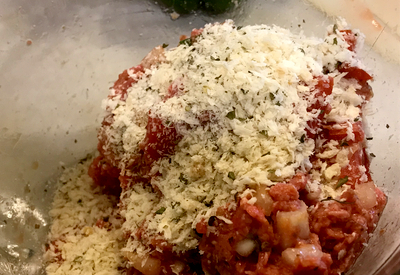 Using raw ground beef is the best way to make stuffed peppers – the flavor is so much better! I have to be honest, the first few times that I was trialing stuffed peppers recipes in the Instant Pot, I pre-cooked the hamburger. There was just something about the thought of putting raw meat inside a pepper and it being completely cooked in just 8 minutes. I just didn’t believe it could be true. However, I finally took the plunge and stuffed the peppers with raw ground beef and the results – PERFECT!!! Adding breadcrumbs to the mixture will help soak up some of the grease as the ground beef cooks. I used a food thermometer to verify that each instant pot stuffed pepper was cooked over 160 degrees F. There was no doubt in my mind that they were safe to eat! Not to mention absolutely delicious! Allowing the meat to cook in the Instant Pot allows all of the flavors and juices to meld together inside the peppers. 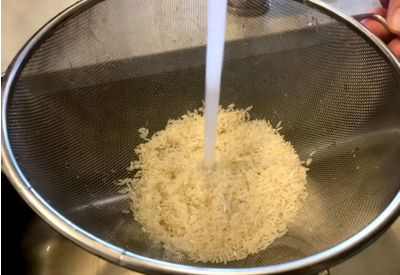 Be sure to rinse your rice before cooking it to prevent the rice from sticking together. Although you don’t need to pre-cook your ground beef, you must use cooked rice for this recipe. It doesn’t matter the type of rice you use, as long as it is cooked prior to it being added to the pepper filling. I will typically cook the long grain white rice in the Instant Pot as I am preparing the other ingredients for the Instant Pot Stuffed Peppers. Making rice in the Instant Pot is easy. 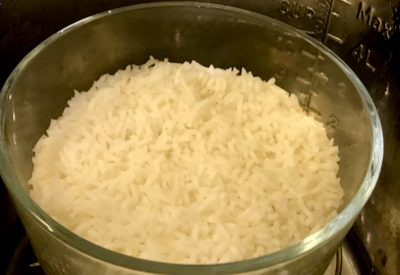 I use 1 cup of well-rinsed long rain white rice to 1 1/4 cup of water in an oven safe bowl. I add 1 cup of water to the liner of the Instant pot. Add the trivet and the bowl of rice/water mixture. Add a drop of two of olive oil and a pinch of salt to the rice/water mixture and push the RICE button. It is pre-set to cook long grain white rice on low pressure for 12 minutes. Long grain rice cooked perfectly in the Instant Pot using the pot-in-pot method. Once the time is over, allow for a natural release of pressure. I prefer to use the pot-in-pot method when cooking rice. Using a separate bowl eliminates the chance of the rice sticking to the bottom of the pot and burning. Add the cooked rice to the other Instant Pot Stuffed Pepper ingredients and you are ready go! I prefer to use fresh tomatoes in this recipe but you can certainly use canned tomatoes. I prefer to use fresh tomatoes in this recipe. However, if you are used to or like thick tomato based stuffed peppers, you can substitute canned tomatoes in the recipe. You can also top the peppers with tomato sauce prior to cooking. And for those who are cheese lovers – top the cooked peppers with cheese and replace the lid in the Keep Warm setting. The cheese will melt in minutes! During garden season we use our fresh peppers to make this recipe. We then freeze the stuffed peppers for a quick and easy meal in the middle of winter! This delicious stuffed bell peppers recipe requires no sautéing of vegetables. Just stuff the peppers with the raw meat mixture and cook. Wash the peppers. Cut off the top part and reserve for later use. Remove seeds and ribs. 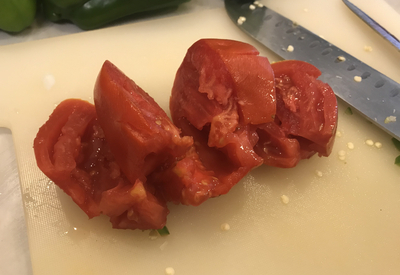 Cut around the stem of 2 of the 4 top sections of the peppers that you cut off. Dice the peppers and set aside. 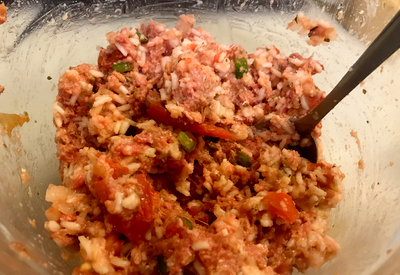 In a medium size bowl, add the diced green pepper tops, onion, ground beef, cooked rice, Italian seasoning, salt, pepper, garlic, breadcrumbs and tomatoes. Mix well. Add the chicken stock to the liner of the Instant Pot. Insert the trivet. Fill each pepper with the mixture and place on the trivet. Place the lid in the locked and sealed position. Pressure cook/manual on HIGH Pressure for 8 minutes. Once the cooking time expires allow for a Natural Pressure Release. You can verify with a cooking thermometer that the beef has reached 160°F. You can replace the fresh tomatoes with ½ can of diced tomatoes (without the liquid) if you prefer. You can drizzle tomato sauce on top of the peppers if prefer to have more of a tomato taste. If you would like to melt cheese do so by placing shredded cheese on top of the peppers and replace the lid of the Instant Pot on the Keep Warm Function for 3-4 minutes before serving. Hi Holly. I freeze them after they have been cooked. To reheat them I put them back in the Instant Pot and Steam them for approximately 10 minutes. I grind my own beef, do you recommend a leaner cut or does it matter? I prefer to use a leaner cut to prevent a lot of grease from forming in the bottom of the peppers.